Lorazepam is one of the preferred agents used for intravenous treatment of status epilepticus (SE). We combined data from two pediatric clinical trials to characterize the population pharmacokinetics of intravenous lorazepam in infants and children aged 3 months to 17 years with active SE or a history of SE. We developed a population pharmacokinetic model for lorazepam using the NONMEM software. We then assessed exploratory exposure–response relationships using the overall efficacy and safety study endpoints, and performed dosing simulations. A total of 145 patients contributed 439 pharmacokinetic samples. The median (range) age and dose were 5.4 years (0.3–17.8) and 0.10 mg/kg (0.02–0.18), respectively. A two-compartment pharmacokinetic model with allometric scaling described the data well. In addition to total body weight (WT), younger age was associated with slightly higher weight-normalized clearance (CL). The following relationships characterized the typical values for the central compartment volume (V1), CL, peripheral compartment volume (V2), and intercompartmental CL (Q), using individual subject WT (kg) and age (years): V1 (L) = 0.879*WT; CL (L/h) = 0.115*(Age/4.7)0.133*WT0.75; V2 (L) = 0.542*V1; Q (L/h) = 1.45*WT0.75. 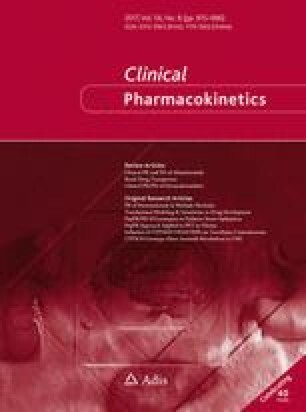 No pharmacokinetic parameters were associated with clinical outcomes. Simulations suggest uniform pediatric dosing (0.1 mg/kg, to a maximum of 4 mg) can be used to achieve concentrations of 50–100 ng/mL in children with SE, which have been previously associated with effective seizure control. The population pharmacokinetics of lorazepam were successfully described using a sparse sampling approach and a two-compartment model in pediatric patients with active SE. The Best Pharmaceuticals for Children Act–Pediatric Trials Network Steering Committee members are listed in the Acknowledgements section. The online version of this article (doi: 10.1007/s40262-016-0486-0) contains supplementary material, which is available to authorized users. The assay measuring lorazepam concentrations was performed at by Christine Grosse, Kenneth Lewis, and Robert Wurm at OpAns Laboratory, Durham, NC, USA. Daniel K. Benjamin Jr, MD, PhD, Katherine Y. Berezny, Duke Clinical Research Institute, Durham, NC; Gregory L. Kearns, Arkansas Children’s Hospital, Little Rock, AR; Matthew M. Laughon, MD, MPH, University of North Carolina, Chapel Hill, NC; Ian M. Paul, Penn State College of Medicine, Hershey, PA; Michael J. Smith, University of Louisville, Louisville, KY; P. Brian Smith, MD, MPH, MHS, Duke Clinical Research Institute, Durham, NC; John van den Anker, George Washington University School of Medicine and Health, Washington, DC; Kelly Wade, Children’s Hospital of Philadelphia, Philadelphia, PA. The Eunice Kennedy Shriver National Institute of Child Health and Human Development: David Siegel, Perdita Taylor-Zapata, Anne Zajicek, Zhaoxia Ren, Ekaterini Tsilou, Alice Pagan. The EMMES Corporation (Data Coordinating Center): Ravinder Anand, Traci Clemons, Gina Simone. This work was funded under National Institute of Child Health and Human Development (NICHD) contract HHSN275201000003I (principal investigator: Benjamin) for the Pediatric Trials Network. Research reported in this publication was also supported by the National Center for Advancing Translational Sciences of the National Institutes of Health (NIH) under award number UL1TR001117. Daniel Gonzalez receives research support from the NICHD (K23HD083465), the non-profit organization Thrasher Research Fund (http://www.thrasherresearch.org), and from industry (Cempra, Inc. and Jacobus Pharmaceutical Company, Inc.) for drug development in adults and children. Michael Cohen-Wolkowiez receives research support from the NIH (1R01-HD076676-01A1), National Center for Advancing Translational Sciences of the NIH (UL1TR001117), National Institute of Allergy and Infectious Disease (NIAID; HHSN272201500006I and HHSN272201300017I), NICHD (HHSN275201000003I), FDA (1U01FD004858-01), Biomedical Advanced Research and Development Authority (BARDA; HHSO100201300009C), and the non-profit organization Thrasher Research Fund (http://www.thrasherresearch.org) for drug development in adults and children (http://www.dcri.duke.edu/research/coi.jsp). Jeffrey T. Guptill receives research support through K23NS085049 from the National Institute of Neurological Disorders and Stroke (NINDS). James M. Chamberlain, Barrie Harper, Jian Zhao, and Edmund V. Capparelli have no conflicts of interest to disclose. The content of this article is solely the responsibility of the authors and does not necessarily represent the official views of the NIH. Both pediatric studies were reviewed and approved by local Institutional Review Boards. For the Status 1 study, patients either pre-consented to participate in the study prior to the presentation of SE or consented to participate in the study after they received lorazepam if they presented to the Emergency Department with SE. For the Status 2 study, participating hospitals submitted a site-specific plan to their Institutional Review Board regarding the specific activities to address the requirements for the Exception from Informed Consent for Emergency Research (21 CFR 50.24). Thus, patients were treated prior to consent and then once their condition had stabilized the family was approached to discuss the study and obtain written consent for continued study participation. Watson Laboratories, Inc. Lorazepam injection package insert. Available at: http://dailymed.nlm.nih.gov/dailymed/drugInfo.cfm?setid=ae274b1f-27c3-483b-99f1-9a9249dc2459. Accessed 12 Feb 2016.